Mid to late summer is the season for exquisite produce at my local farmers’ market. There are bins at each stand brimming with vegetables in vibrant hues. This irresistible produce was the inspiration for the following recipe for savory vegetable tarts. The tart shells are made with purchased puff pastry sheets that are cut into squares. A creamy spread of goat cheese and Parmesan is smoothed over bottom of each pastry shell and topped with sautéed shallots and garlic. Then, thinly sliced tomatoes and zucchini are added as a final layer. When baked, the puff pastry becomes golden and crisp, and the roasted vegetables tender and sweet. Fresh julienned basil is the only garnish needed. 1. Arrange a rack at center position and preheat oven to 400 degrees F.
2. Place 2 tablespoons olive oil in a medium skillet set over medium high heat. When hot, add shallots and sauté, stirring, until softened and lightly browned, about 3 minutes. Add garlic and cook, stirring, 1 minute more. Remove from heat and cool slightly. 3. In a small bowl, combine the goat cheese, Parmesan, and cayenne pepper and stir with a fork to blend well. 4. Place one puff pastry sheet on a lightly floured work surface, and with a rolling pin, gently flatten the seams. Cut each sheet into four equal squares. With a sharp knife, lightly score a 3/4 inch border around the inside edge of each pastry square, taking care not to cut all the way through the dough. (You simply want to trace a frame within each square, which will rise around the filling and form the sides of each tart.) Repeat with the second pastry sheet. Transfer squares to 2 baking sheets. 6. 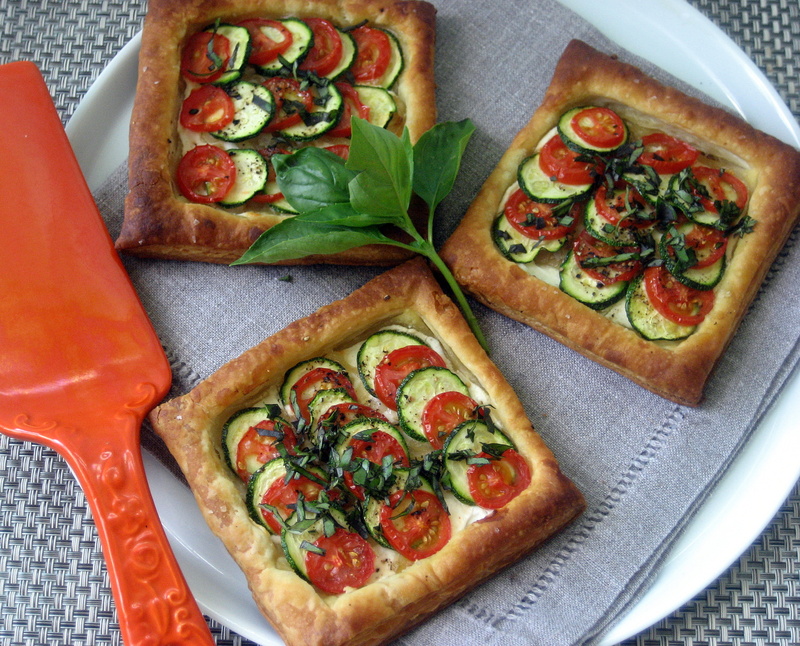 Garnish each tart with julienned basil and with a fresh basil sprig if desired. Serves 8. This entry was posted in 2012 Recipes, Appetizers, Light Main Course, Recipe Pantry and tagged summer, tarts, vegetables by brosbottom. Bookmark the permalink.